I’ve been hearing good things about Brasserie Zédel for a while and it’s all true – a great establishment in the heart of London, with good French brasserie food at extraordinarily good prices, accomplished service and amazing decor. Originally the public rooms of the Regent Palace Hotel, designed in the Beaux Arts style, it opened in 1915 and was at the time the largest hotel in Europe with over 1,000 bedrooms. Redesigned in the 1930s in eclectic Art Deco style, and carefully restored to reopen in June 2012, the results are said to be some of the most authentic 1930s interiors in the UK. The main room, the actual Brasserie, is a riot of gold, marble, brass and red velvet and although it’s way below ground level it’s wonderfully bright and airy. The food is classic french, with some great bargains – when did you last see a fixed price menu offering two courses for £8.75, three for £11.25? Soup of the day – when we visited a tempting celeriac and parsnip – is £2.25. A very good little spinach tart was £3.95, a fabulous egg mayonnaise £3.50. There’s a really good range of main course choices including three based on choucroute: I went for the most basic, the Alsacienne (£12.95) which had a variety of smoked and cured meats and a delicious frankfurter on its bed of spiced cabbage. There’s also a fishy version at £15.50. The dish of the day was pork escalope Cordon Bleu (£12.95), cooked to perfection, and there were other votes of confidence for confit of duck with braised Puy lentils (£11.75) and sautéed chicken with bacon, noodles and a champagne sauce (£14.95). Puddings are classic too, from a tarte au citron at £3.50 through the wonderful sounding Bavarois à la Vanille et Rhubarbe at £4.95, to what I bet is a brilliant chocolate mousse at £6.75 – alas we didn’t have room. The wine list is short but interesting, with a Sauvignon Pays d’Oc a steal at £16.95 or a Carignan Pays du Gard for the same price in the reds. The service is perfect – prompt, friendly but unobtrusive – and all in all, this is a place that deserves to become a permanent and beloved fixture in London life. 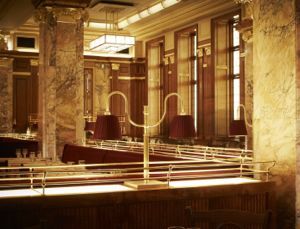 Now we need to pop back to check out the Bar Américain, “an extraordinary survival with its broad, horizontal stripes of stained birch veneers and jazz age columns”. The cocktails are reputed to be pretty good, too.